WLSO.FM presents Longtown Sound 1494 Pancake Wednesday Featuring Aimee Mann, Aaron English, Mark Wayne Glasmire, John Taglieri, Jimmy Catlett, Jenn Bostic and Jesse Terry. ‘Wide Awake & Dreaming’ plays at the 14:35 mark! Check out the whole 30 minute show though…great music all-around! Check out this great review of ‘Days Like These’ from the Uber Rock Website! Check Out John On The Musicians Unleashed Podcast! Check out this interview John did on the Musicians Unleashed Podcast about how to make a living as an indie artist! ‘Days Like These’ Now Available on Amazon!! ‘Days Like These’ is finally available on Amazon.com! Due to a glitch in their system, the EP didnt make it up in time for release. For those of you who are Amazon fans (Like us!) Heres your link! 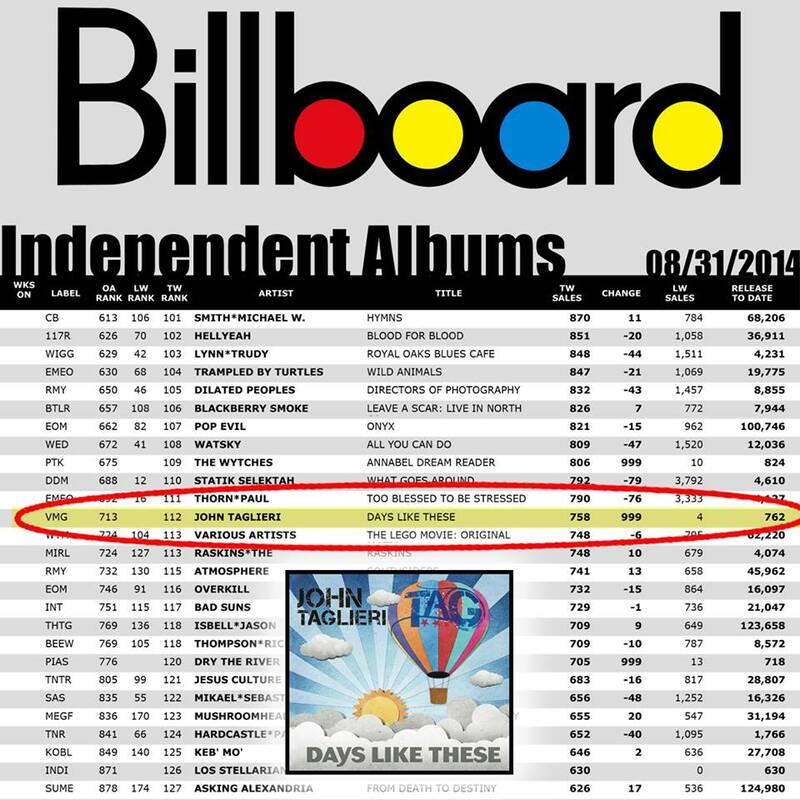 John Taglieri Slams Into Billboard Independent Album Chart at #29! ‘Days Like These’ PreSale Winner Guitars!! Congrats Su Abbott! 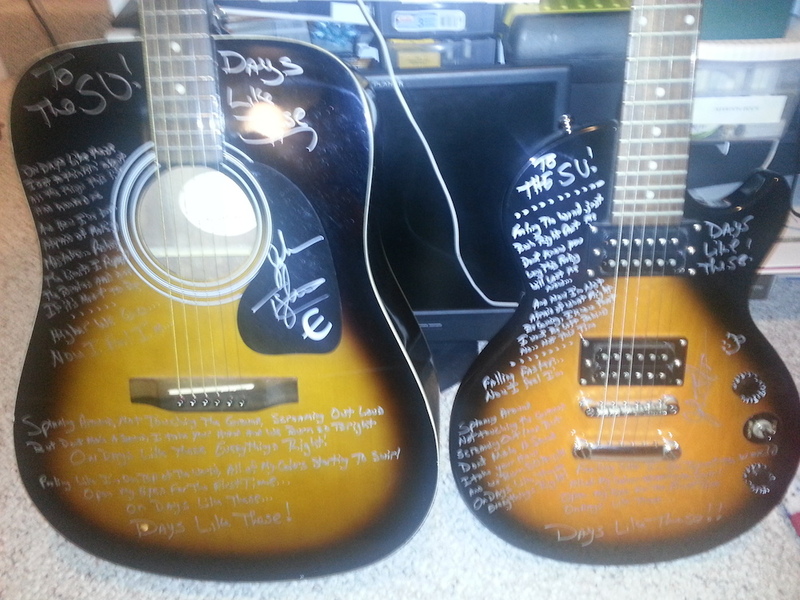 The guitars for the ‘Days Like These’ grand Prize winner, Su Abbott…all polished up and signed with lyrics added! Should be on their way to The SU later today! ‘Days Like These’ Debuts on Billboard! Leap Dog Music and Vanity Music Group are TRULY excited to announce that ‘Days Like These’ has debuted this week on Billboard’s Independent Album Chart at #112!!! The single peaked at #26 on Amazon.com’s Rock Chart & the EP hit iTunes Top Sellers…and now it hits Billboard. This is truly humbling and amazing. You guys are awesome beyond all words for all the support and love you give. Keep spreading the word and tell all your friends about the EP! New Tour Dates Added for Sept, Oct & Nov! Be sure to check the Tour section of the website. New dates have been added in MA, VT & FL. John will also be heading back out on the road for the US Military for a week of dates as well. If he’s in your area, make sure to stop into a show! Posted by: Rocktime29 / 08/2014 Category: Reviews This is the twelfth release of very talented songwriter Taglieri !! “I’m very lucky, I had an amazing career that has traveled with equally amazing places. My wife and the new member of my family is my support base and lead me to write music. My new release is the perfect fusion between optimistic-rhythmic songs and some quieter moments … songs about life, songs for the ‘top’ and ‘bottom’ us. the “Days Like These” was written on the day my wife and I discovered that we were having parents beautiful baby!’s really incredible feeling that dad would become “. For the “Days Like These” o Taglieri collaborated with great musicians such as Kenny Aronoff (John Mellencamp, Elton John, Bob Seger, etc. ), Alan Jax Bowers (Parrot Bay, Rachel Allyn), Rich Redmond (Jason Aldean, Ludacris, Kelly Clarkson, etc. ), Lee Turner (Darius Rucker, Sara Evans), Eric Ragno (Alice Cooper, Paul Stanley, Billy Gibbons, etc. ), Joe Gilder, Greg Juliano (Juliano Brothers) and Keith Lubrant (whose music ‘dress’ TV shows like Real Housewives of Miami, Beavis and Butthead, Here Comes Honey Boo Boo, Young and the Restless and many others). The key then you will hear in this 6-track mini album is abundant melodies, up-tempo rhythms, beautiful harmonies, memorable choruses that will keep us company during the hot summer nights and is generally an ‘easy’, good travel and very pleasant album from beginning to end! The inaugural “Days Like These” is one of the best tracks from the new album. A fantastic and very rhythmic pop-rock song that will make you humming for days. The “Here For The Taking” has a touch of ‘new ‘Bon Jovi while “Beautiful Tonight” we are dealing with a simply stunning diamond rock. This “Thin Air” takes us to the more relaxed melody and then acoustic ballad “Finish Line” fills us with beautiful emotions. Check out this review of ‘Days Like These’! Solo careers. They are becoming all too common these days with artists wanting to branch out of their work with their main bands and do something on their own. Some solo artists embark on solo careers from the very start of their music career and for some, it works out very well but is it the same for the artist I am featuring in this review? Only one way to find out and that is to review it. The artist in question for this is American musician John Taglieri, who began a solo career in the late 90’s and releasing his works on his own record label. Recording your own music while running your own record label as well, sounds like very hard work and some artists bite off more then they can chew. 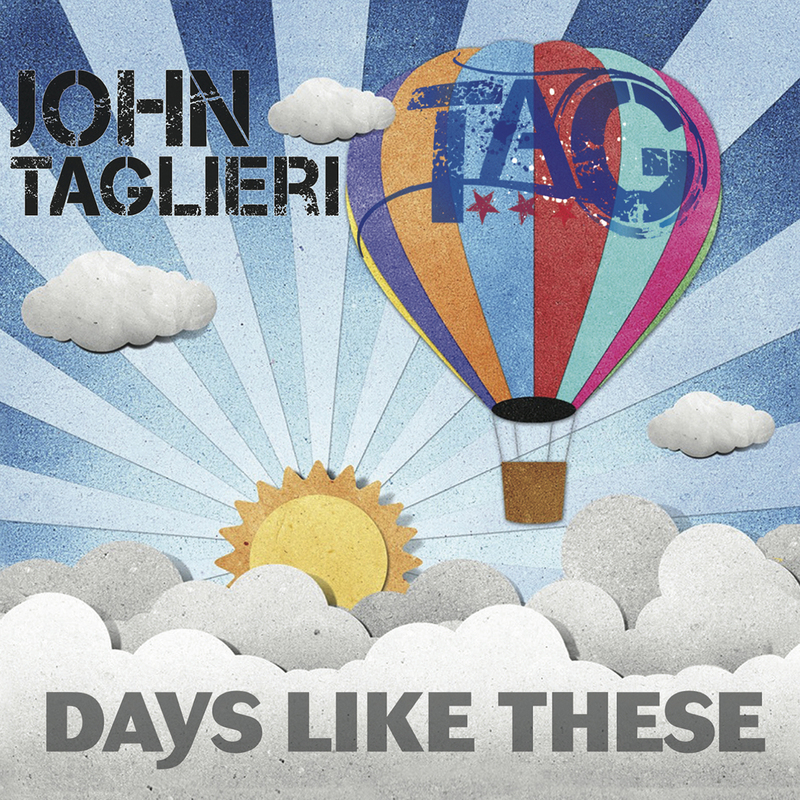 Releasing his first solo album “Leap of Faith” in 1999, John Taglieri has been experimenting with a range of different styles including Pop Music and Country Music, but has gone back to his Melodic Rock roots with his new EP “Days Like These”. Normally solo artists write, record, and perform all the music themselves but that’s not the case with the new John Taglieri EP, as here, he is writing, recording and performing with some of his friends in the music scene and some of them are pretty big names, such as Eric Ragno (Alice Cooper, Paul Stanley) and Rich Redmond (Ludacris, Kelly Clarkson), to name a few. Collaborating with other artists, even as a solo artist, is often a good idea as some solo artists realize and understand that trying to write, perform and record all the music yourself can be a bit of a nightmarish task. John Taglieri has understood that risk and has not wanted to take it, so by collaborating with others, he is clear about wanting to make a good release for the listeners. Another risk as a one hundred percent solo artist, is also trying to juggle family life too, especially if you are married and have kids, but some manage it well and John Taglieri has been able to manage it quite well. So, where does this leave his new release “Days Like These”? Having not heard his previous works, I don’t know how to compare the new to the old, but upon first listens to this new release, it’s clear he is very passionate about music as it sounds very soulful and quite cheerful in places. Only thing that may seem a bit off in places, is the vocals, but often the delivery can oversee that problem and thankfully it’s the same here, as the vocal delivery is very good and it compliments the soulful and cheerful music on this short six song EP spanning out across roughly 21 minutes. So is this a solo career that should stay as it is, or should John Taglieri sign himself on with a band? Well since the late 90’s, he has been able to juggle his family life and his music career very well and this new EP “Days Like These” is very melodic, and I like melodic music, so this already gets the thumbs up from me. There’s definitely a lot of soul and passion being put into John’s music and if you like soulful, cheerful, and melodic music, then this short six song EP will be ideal for you and it’s clear that John Taglieri should carry on as he is as a one hundred percent solo artist.